December 2, 1980. That portion of the river—including its major tributaries, Hidden Creek, Mystery Creek, Albert Johnson Creek and the North Fork Aniakchak River—within the Aniakchak National Monument and Preserve. Wild — 63.0 miles; Total — 63.0 miles. 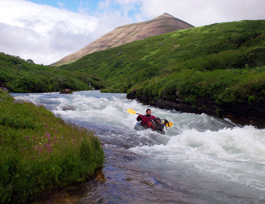 Lying entirely within Aniakchak National Monument and Preserve, you can float the river from inside the caldera of a volcano to the ocean past spectacular wildlife and geology. The river moves swiftly through a narrow gorge, and large rocks demand precise maneuvering. Only the most experienced rafters contemplate this float trip that takes three to four days to complete.